The Kansas City Metropolitan Bar Foundation Liberty and Justice Gala was held Saturday, September 12, 2015 at the Midland Theater. 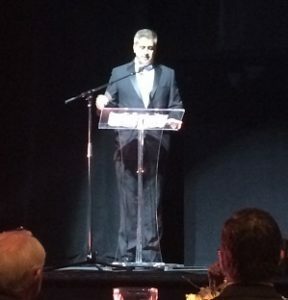 Peter Hartweger, President of the Foundation, gave a report at the Gala on the state of the Foundation and its programs, including the Foundation’s signature program – Military Matters – which provides pro bono legal services to local veterans and active military members and their families. Over 325 people attended this year’s Gala, which raised more than $120,000. Spencer Fane lawyers and spouses who attended were Peter and Molly Hartweger, Denise and Dan Portnoy, and Dave and Vicki Schatz.